From SD Toys. 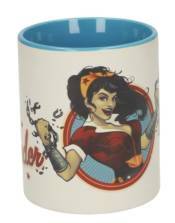 Wonder Woman looks amazing as a Justice League Bombshells pin-up, and now she's on your mug! Heat things up in the morning with this ceramic mug featuring Wonder Woman breaking some chains!